The logistical operation of the reigning bike race champions transports the team from Austria to Argentina. It’s no coincidence that the last 12 editions of the Dakar Rally have seen a KTM rider on the top step of the podium. The Austrian manufacturer has built an era of invincibility through methodical preparation as well as expert riding over desert dunes. The Red Bull KTM Factory Team is aiming to add to their success story by bringing another competitive rider line-up to the 13-stage desert classic. 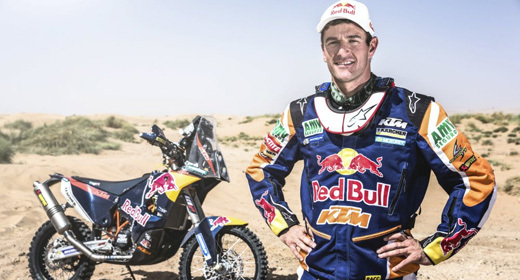 Among those flying the flag for KTM in South America will be three-time Dakar champion Marc Coma plus podium regulars Ruben Faria and Chaleco Lopez. These riders and their KTM 450 Rally bikes are supported at the race by a logistical operation that takes an entire year to plan and features a total of 34-team members onsite at the Dakar. 24 engines, 150 wheels and other essential supplies are all carefully prepared for the race at KTM’s headquarters in Mattighofen, Austria. The mechanics must be able to anticipate every eventuality at the world’s toughest rally-raid and make any necessary repairs on the spot. The nuts and bolts of the operation are found inside three 26-ton MAN support trucks that contain an abundance of tools and spare parts. All work on the bikes is performed within an allotted area of 1500 square metres inside the Dakar bivouac so precise organisation is vital. After a rigorous check of the inventory every component of the Red Bull KTM Factory Team, including KTM 450 Rally bikes, MAN support trucks, Adria motorhomes and three Land Rovers, was brought to Le Havre for transportation to South America. The KTM fleet along with nearly 700 other race, assistance, organisation and press vehicles has since been loaded into the massive hold of the Grande Roma shipping container. Crossing the Atlantic Ocean between France and Argentina will take three-weeks and on arrival in South America a completely new journey will begin as the 2014 Dakar Rally gets underway. Dakar: Will the new KAMAZ repeat their triumph?